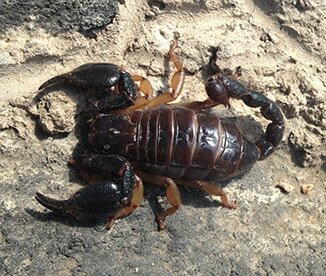 Family Diplocentridae, a relatively small group of scorpions, currently comprises 10 genera and nearly 130 species distributed in Norh America (southern USA, Mexico), Central America (Guatemala, Honduras, Costa Rica), South America (Colombia and Venezuela), in the Caribbean; and interestingly, some species are also found in the Arabic Peninsula. I worked with genus Diplocentrus under the supervision of my PhD advisor Prof. Oscar F. Francke Ballvé at the Colección Nacional de Arácnidos of the Instituto de Biología of the Universidad Nacional Autónoma de México; and with Prof. Lorenzo Prendini, curator of the Arachnid collection of the Department of Invertebrate Zoology of the American Museum of Natural History in NY. These projects included the phylogenetic systematic revision of genus Diplocentrus and the description of a new genus, Kolotl Santibáñez-López, Francke & Prendini, 2014. For more information please refer to this site. 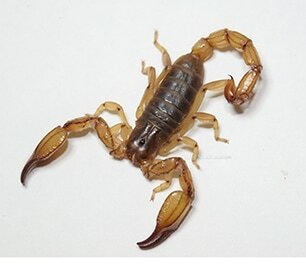 Currently comprises two scorpion species, among the largest ones in the family, that are distributed in Central West Mexico. It is easily distinguished from the rest of the diplocentrids because these two species have increasing neobothriotaxic, which means they have more trichobothria and different trichobothria arrangement in the pedipalp than the other species. Below, the paratype female of Kolotl poncei is shown, which was collected in Michóacan, Mexico. The most diverse genus of the family, with 63 species distributed from Southern USA to northern Honduras. They exhibit size variation; for example, the length of smallest species (Diplocentrus bereai) is 20-30 mm; and the length of the largest species (Diplocentrus taibeli) is 80-100 mm. Most of the species are fossorial, which means they build burrows on the ground where they spend most of the life, and they just leave it when it is reproduction season. However, two species (Diplocentrus cueva and Diplocentrus anophthalmus) inhabit caves. The systematic revision of this genus is almost complete. Below, a male specimen of Diplocentrus hoffmanni Francke, 1977 is shown, along with the entrance of its burrow. This species is distributed in Oaxaca, Mexico.